The amount of seasoning sachet can be appropriately used according to one's personal taste. Allergy Advice: Contains Wheat Gluten, Sesame, Liquorice. Ingredients: Noodles: Wheat Flour (Gluten) (73%), Water, Palm Oil. Oil Sachet: Palm Oil, Low Erucic Oil, Rapeseed Oil, Chilli (1.9%), Sesame, Sichuan Peppercorn (0.47%), Ginger, Shallot, Spices (Cinnamon, Liquorice, Laurus Nobilis, Star Anise, Lemongrass, Cumin), Chilli Flavour (0.12%), Water. Flavour Sachet: Salt, Flavour Enhancer (E621), Flavouring, Flavour Enhancer (E635), Thickener (E415), Sugar, Yeast Extract. 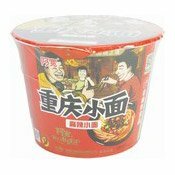 Simply enter your details below and we will send you an e-mail when “Chongqing Instant Noodles Bowl (Spicy Hot) (阿寬重慶小麵 (麻辣))” is back in stock!